I travel to university and high school campuses around the country giving workshops and presentations on social justice — specifically the oppression of LGBTQ people — and LGBTQ and queer studies in general. At a recent presentation, a college student asked me what my undergraduate LGBTQ student group was like. “Was there much resistance from the university administration and from other students?” she inquired. As she asked me these questions, my head began to whirl with visions of my undergraduate years. I stopped long enough to inform her that I graduated with my B.A. degree from San José State University on June 13, 1969 – 15 days before the momentous Stonewall Rebellion, an event generally credited with igniting the modern movement for LGBTQ liberation and equality. I later learned that a few officially recognized groups existed before 1969 at Cornell, NYU, Stanford, MIT, as well as the prototype Student Homophile League forming at Columbia University as far back as 1967. But as an undergraduate college student from 1965 to 1969, the concept of an “out” person, let alone an organized, above-ground student group wasn’t even in my range of possibilities. I was born during a very politically conservative time in U.S. history, possibly even more conservative than today. The times were known as “The Cold War” directly following World War II, a time when any sort of human difference was held suspect. On the floor of the U.S. Senate, a brash young Senator from Wisconsin, Joseph McCarthy, loudly proclaimed that “Communists corrupt the minds and sexual perverts (homosexuals) corrupt the bodies and morals” of good, upstanding Americans. He preceded to purge accused Communists and homosexuals from government service. The first edition of the American Psychiatric Association’s Diagnostic and Statistical Manual of Mental Disorders (DSM), published in 1952, described homosexuality as “sociopathological.” Homosexuals, bisexuals, and gender diverse people were involuntarily committed to psychiatric hospitals and sometimes given electroshock treatments and even pre-frontal lobotomies. Since gender confirmation medical procedures were illegal in the United States then, Christine Jorgenson, born Joseph Angelo, went to Copenhagen, Denmark to become the first U.S. citizen to procure these procedures. By August 1966, LGBT people fought back in the first larger-scale collective resistance to oppression at Gene Compton’s Cafeteria in San Francisco when police conducted a raid at the cafeteria and physically harassed the clientele. People hurled coffee at the officers, heaving cups, dishes, and trays around the cafeteria. Police retreated outside as customers smashed windows. Over the course of the next night, demonstrators gathered to picket the cafeteria, which refused to allow trans people back inside. Notice the total erasure of women in this statement. On December 14, 1967, peace advocate and civil rights leader Dr. Martin Luther King Jr. recited this statement outside a California prison which was holding Vietnam War protesters. 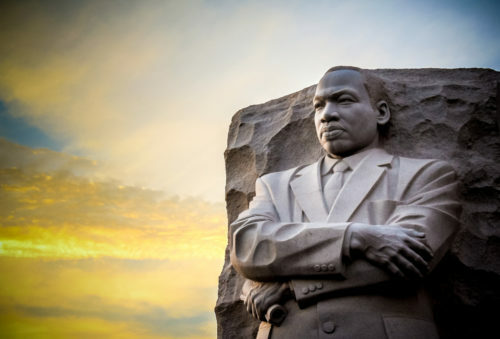 Though our society has traveled somewhat forward on a path toward King’s goal of peace with justice, glaring and deep potholes and trenches remain — these continually inhibit our nation’s progress. Though the U.S. Congress passed the 13th Amendment of the U.S. Constitution abolishing slavery on January 31, 1865 and the President signed it into law on December 6, 1865, black and brown lives continue not to matter relative to white lives. This has been the case through Reconstruction and the Jim Crow south into the 20th century and beyond as we’ve clearly observed in the current spate of murders of black and brown people by police officers. Black people in the United States coined in 1960s battle cries “Black is Beautiful” and “Black Power” as counter-hegemonic narratives in a nation that views dark skin as ugly and white people fight ruthlessly to preserve supremacy. Recently black people created the rallying cry and organization “Black Lives Matter” in a country where historically black lives have not mattered much relative to white lives. Also, women have organized the #MeToo and Time’s Up movements to call attention to and fight against sexual harassment and oppression, which the society has all too frequently attempted to brush under the dirty carpet of intimidation and silence. I turned 21 in May 1968, and, therefore, I was authorized to vote for the first time because back then, the legal voting age was 21. However, at the age of 18, I, my friends, and classmates were old enough to be eligible to fight and die in Vietnam, a war I actively protested and worked vigorously to end. 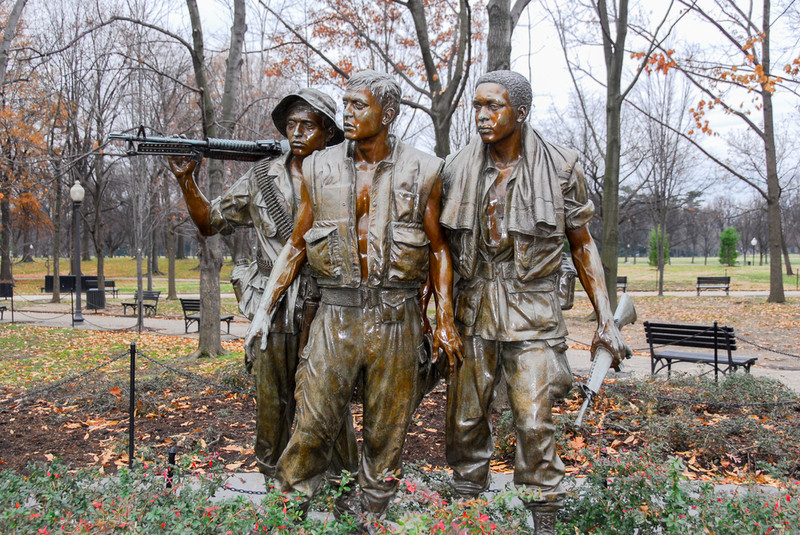 Many like myself viewed the war as a blatantly criminal, illegal, and unjustified invasion and occupation that brought misery and death to our military and to the people of North and South Vietnam. Later, we seemed not to have learned from history as George W. Bush marched our brave troops into another criminal, illegal, and unjustified invasion and occupation in Iraq, one that brought misery and death to our military and to the people of the entire Middle East by destabilizing the area. Fifty years ago, at the historic 1968 Democratic National Convention in Chicago, the tensions erupted inside and outside the convention hall as police violently and summarily attacked protesters. As an undergraduate student at San José State University, I joined the Students for a Democratic Society (SDS) to oppose the war. I helped organize demonstrations, attended and led study groups and sit-ins, and I also worked to improve conditions in student off-campus housing. I also activities to challenge racism on our campus. Though I became involved in my Young Democrats group in High School in early to mid-1960s, and even ran and was elected as Secretary of our group named after then Vice President of the United States, Hubert H. Humphrey, my deep political education took off in college. Looking back, I remember much more what I learned outside the classroom than in my courses, for those were truly exciting and terrifying times of war, riots, and political assassinations. While we lauded President Lyndon B. Johnson on his courageous leadership in the realm of his domestic policies, especially in his active and enthusiastic support for the passage of the 1964 Civil Rights Act and Voting Rights Act one year later, we saw how his military ventures had torn the country apart. Stepping into the political void left in the progressive wing of the Democratic Party after what we saw as Humphrey’s capitulation to his administration’s disastrous hawkish military policies, a fresh and dynamic voice articulated the feelings and visions of a younger generation of concerned activists. Senator Eugene McCarthy of Minnesota courageously challenged a sitting president of his own party, and along the way, he captured our imagination, hearts, and minds. Running in the first state primary in New Hampshire that year, he garnered 42% to Johnson’s 49% of the vote. Four days later, seeing that Johnson could possibly lose his small lead in the primaries, New York Senator Robert F. Kennedy threw his hat into the ring. And then we were all completely thunderstruck with surprise watching Johnson give a televised address on March 31, 1968, when he suddenly uttered from the Oval Office that “I shall not seek, and I will not accept, the nomination of my party for another term as your President.” Less than one month later, on April 27, Humphrey announced his candidacy. For a full five additional years, the body bags carrying the fallen continued to pile up. The people of Vietnam, combatants and civilians alike, continued suffering the horrors of incinerated flesh and scorched fields and forests from the massive airdrops of Agent Orange from U.S. bombers, increasing the already massive profits by Dow Chemical Company and other corporations. Race relations worsened, as did the already large gap in wages and accumulated wealth between the socioeconomic classes. Nixon’s involvement in Watergate and his eventual resignation further divided the country. A new generation of young social and political activists poured out of their schools around the country on Wednesday, March 14, 2018, to mourn and to protest the senseless loss of 17 innocent beautiful souls cut down by a shooter exactly one month earlier at Marjory Stoneham Douglas High School. Like those of us chronicled by then 23-year-old poet laureate Bob Dylan of an earlier generation during another defining historical moment, these new social warriors also gathered ‘round people to give testimony on the tragedy of firearms violence by demanding that legislators and others in positions of power start swimmin’ or else sink like a stone. I heard of the tragic death of Dr. King on that early Spring evening in 1968 when I was a 20-year-old junior at San José State University. Before and ever since, I have been continually inspired by his words and his deeds. At this crossroads today in our collective national consciousness, we have an opportunity to address the legacy of oppression in all its many forms that divide us. If we do not, we will never move forward out from the abyss of our past to a better future. If we do not, we will continue to remain on the endangered nations list.